When it comes to safety in the church nursery/preschool area, we tend to think about things like child check in/pick up, screening volunteers and the toys/equipment in the nursery; which are all valid things to think about, but today let's think about another area which you may not initially consider when it comes to safe nursery and preschool classes . 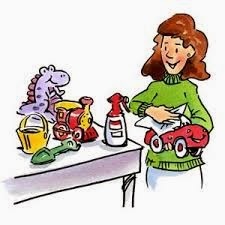 . . germ warfare and cleaning toys. We want our classroom environment to be an amazing environment - even on a shoestring! Our nurseries are spaces for little ones to be cared for, play in and for us to begin to introduce them to Jesus! Preschool classrooms are spaces for children to learn about Jesus and a place to play. Let's create environments your children - and their parents - will love! Label two toy "baskets" for each service and fill one with toys which are clean and available for children to play with for the current service. As children play with a toy - especially if you see them put it in their mouths - place the toy in the "dirty" basket. At the end of the service, place all toys into the "dirty" basket and bring out a fresh, clean basket of toys. These things do not take a lot of money and may seem like "no-brainers", but if you are not intentional about being sure the things children come in contact with are cleaned each and every week, they will end up not being clean. What do you do to be certain your nursery and preschool areas are clean?